On September 11, 2012, the U.S. consulate in Benghazi, Libya, was attacked resulting in the deaths of four U.S. citizens, including Ambassador Christopher Stevens. OBAMA: Well, it’s too early to know exactly how this came about, what group was involved, but obviously it was an attack on Americans. I couldn’t get past the fact that upper-level journalists at CBS had been a party to misleading the public. She says CBS posted the transcript to its website the night before the election, but it was lost in the final hours of the campaign. An internal investigation was promised but never happened. …worse than anything Nixon ever did. […] the interlopers were able to co-opt my iMac and operate it remotely, as if they were sitting in front of it. They rarely said the story wasn’t going to air. They just let it sit around and ‘loved it’ until it began to stink like old fish. She says stories were repeatedly rewritten, watered down and delayed until they never made air. She says they weren’t only stories about the administration but also about government waste and corporate conduct, such as questions about the Boeing Dreamliner. Katallah’s detention motion says that in the days preceding the attack, the defendant “voiced concern and opposition to the presence of an American facility in Benghazi.” According to the motion, a group of 20 or more “armed men,” including militia members, assembled outside the U.S. compound at 9:45 p.m. the night of September 11, 2012, and “aggressively breached” the gate. They carried rifles, handguns and rocket-propelled grenade launchers. After breaching the gate, they stole a U.S. vehicle, “forcibly entered” buildings and stole U.S. property. During this initial attack, buildings within the Mission were set on fire, and that ultimately led to the deaths” of U.S. Ambassador Chris Stevens and Information Management Officer Sean Smith. The defendant’s participation in the attack was motivated by his extremist ideology. They also allege that Khatallah “voiced concern and opposition to the presence of an American facility in Benghazi” days prior to the attack. In a courtroom in our nation’s capital, today we took the first step down the road to justice for the four American heroes killed in Benghazi. This prosecution is a reflection of our determination to honor the sacrifice of U.S. citizens who perish on foreign soil in service to our country. We will be steady, deliberate and relentless in seeking to hold accountable all who were responsible for this deadly act of terror. A U.S. official confirms that Ahmed Abu Khatallah, the man accused of masterminding the attack will appear in a federal court in Washington, D.C. today. Authorities believe Khatallah is one of the senior leaders of Ansar al Sharia, whose members were among several militias that participated in the attack. Clinton reveals in Hard Choices, her yet to be released book, that she accepts responsibility for lives lost in the attack but refuses to enter into debate on her actions as she believes “a regrettable amount of misinformation, speculation and flat-out deceit” is floating in the air. Clinton said she ordered an investigation within nine days of the attack and has implemented all 29 recommendations by the Accountability Review Board. Clinton insists that the event is blown out of proportion by some media persons and political opponents She refuses to react to the criticism as she believes America needs to stop politicizing issues related to dead Americans. The 9th U.S. Circuit Court of Appeals in San Francisco court orders YouTube to take down an anti-Muslim film that sparked violence in many parts of the Middle East. The decision by a divided three-judge panel said the YouTube posting infringed actress Cindy Lee Garcia’s copyright to her role, and she, not just the filmmaker, could demand its removal, based on an assessment of the control of the clip, not its contents. Alex Kozinski: Garcia’s performance was used in a way that she found abhorrent and her appearance in the film subjected her to threats of physical harm and even death. Despite these harms, and despite Garcia’s viable copyright claim, Google refused to remove the film from YouTube. Garcia said she was duped into appearing in the film by Mark Basseley Youssef. She said the script she saw referenced neither Muslims nor Mohammad, and her voice was dubbed over after filming. You make these choices based on imperfect information. The Washington Post reports that U.S. officials suspect Sufian Ben Qumu, an ex-Guantanamo detainee, “played a role in the attack on the American compound in Benghazi, Libya, and are planning to designate the group he leads as a foreign terrorism organization.” Ben Qumu is based in Derna, Libya and runs a branch of Ansar al Sharia headquartered in the city. Ben Qumu is one of the original “Arab Afghans” who traveled to Afghanistan to fight the Soviets in the 1980s. In the years that followed the end of the anti-Soviet jihad, Ben Qumu followed al Qaeda to the Sudan and then, in the mid-to-late 1990s, back to Afghanistan and Pakistan. He was eventually arrested in Pakistan after the 9/11 attacks and transferred to the American detention facility at Guantánamo Bay. Qumu is described as an associate of Osama bin Laden. A New York Times report on the attack calls into question much of what Republicans, accusing the Obama administration of a cover-up, have said about the incident. The three main points of contention have been whether the attack was planned, whether it was sparked by an anti-Muslim video, and whether al Qaeda was involved. The GOP suggests the administration removed specific terror references and stuck to the explanation advanced by Rice — later proved untrue — that the attack was the result of spontaneous demonstrations over the U.S.-produced film “Innocence of Muslims,” which contained scenes some Muslims considered blasphemous. The White House and its allies in Congress have said any confusion and conflicting information in the early hours and days after the assault stemmed from the “fog of war,” not any deliberate effort to mislead the public. CRUZ: In between 9:42 p.m., Benghazi time, when the first attacks started, and 5:15 am, when Mr. Doherty and Mr. Woods lost their lives, what conversations did either of you have with Secretary Clinton? CRUZ: And General Dempsey, the same is true for you? McCAIN: Why didn’t you put forces in place to be ready to respond?,” Senator John McCain asked the general. McCAIN: You never heard of Ambassador Stevens’s repeated warnings? DEMPSEY: I’m not blaming the State Department. Defense Secretary Leon Panetta testified this morning on Capitol Hill that he met with President Obama at a 5 o’clock prescheduled gathering, where they spent about 20 minutes talking a lot about the American embassy that was surrounded in Egypt and the situation that was just unfolding in Benghazi. Leon Panetta said Sunday that lack of intelligence information and logistical challenges made it difficult to respond quickly to the attack on the U.S. Consulate in Benghazi, Libya, last year. Panetta said the administration had no warning about the attack, despite requests for more security from U.S. Ambassador Chris Stevens in the weeks leading up to the violence. This is not 911. You cannot just simply call and expect within two minutes to have a team in place. It takes time. We deployed. We knew there were problems there. We moved forces into place where we could deploy them quickly if we had to. They were ready to go. In these situations, you’ve got to look at what we we’re facing, what we knew, what intelligence we had in order to respond. Admittedly, better intelligence about what was taking place there would have given us a head start. 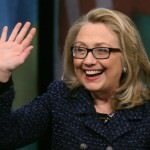 In her last one-on-one interview before she steps down on Friday (1 Feb), Clinton told AP that the attack in Benghazi was the low point of her time as America’s top diplomat. But she suggested that the furor over the assault would not affect whether she runs for president in 2016. She also said that critics of the administration’s handling of the attack don’t live in an “evidence-based world,” and their refusal to “accept the facts” is unfortunate and regrettable for the political system. I was so unhappy with the way that some people refused to accept the facts, refused to accept the findings of an independent Accountability Review Board, politicized everything about this terrible attack. My job is to admit that we have to make improvements and we’re going to. There are some people in politics and in the press who can’t be confused by the facts. They just will not live in an evidence-based world. And that’s regrettable. It’s regrettable for our political system and for the people who serve our government in very dangerous, difficult circumstances. You have to get up every day and work to do best you can and communicate that to the vast majority of fair-minded Americans whether they’re in Congress, in the press or in the public. Clinton also said there are “terrible situations” playing out in the Congo and Syria and said she wished there were clear paths for the international community to solve those crises as well. The New York Daily News reports that closeups of Secretary of State Clinton taken during her Senate testimony Wednesday revealed that her head injury last month left her with lingering vision problems. As she testified about the Sept. 11 attack on the U.S. Consulate in Libya, Clinton appeared to have tiny vertical lines etched onto the left lens of her new brown glasses. Clinton’s spokesman confirmed Thursday night she is wearing the special glasses as a result of the fall and concussion she suffered last month, but he did not elaborate. 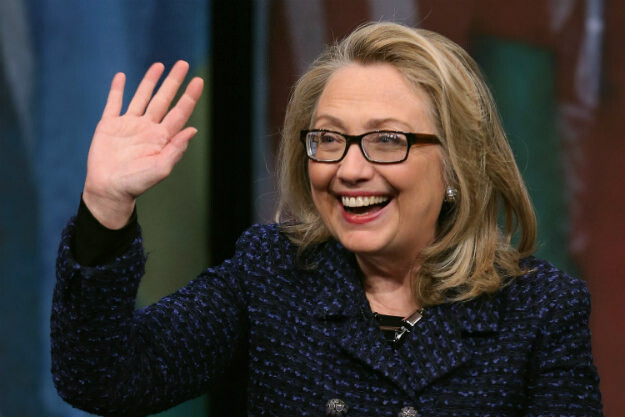 Experts told the Daily News that Clinton likely has a Fresnel prism placed on her glasses. The adhesive panel is used to treat double vision. After her fall and concussion, Clinton was later hospitalized at New York-Presbyterian Hospital Columbia for a blood clot near her brain. The UK’s Foreign Office has been advising against travel to the area since last September, but stepped up its warning yesterday in response to “specific” intelligence, telling British nationals to leave “immediately”. We are aware of a specific and imminent threat to Westerners in Benghazi, and urge any British nationals who remain there against our advice to leave immediately. One intelligence source told The Daily Telegraph that MI6 had picked up a “credible threat” linked to last week’s Algerian raid, in which al-Qeada militants stormed a BP gas complex and killed dozens of foreign workers. According to the Daily Telegraph, sources in the Libyan city itself suggested the threat had been made against the British School of Benghazi, which announced it would close for a week at least, and other international “institutes”. There have already been several reports of links between Libya and the Algerian hostage takers. Hillary Clinton testifies before the Senate Foreign Relations Committee, an appearance delayed more than a month because of her ill health. She grew angry when a Republican accused the Obama administration of misleading the country over whether the attack stemmed from a protest. With all due respect, the fact is that we had four dead Americans. Was it because of a protest, or was it because of guys out for a walk one night who decided they’d go kill some Americans? What difference, at this point, does it make? It is our job to figure out what happened and do everything we can to prevent it from ever happening again. Clinton said that there were at least 20 other U.S. diplomatic posts under serious security threat, but declined to name them at the public session. Senator Bob Corker saying the Benghazi attack and the U.S. response displayed “woeful unpreparedness” for the events sweeping the region. Senator Rand Paul said Clinton should have been fired. Clinton repeated comments she made on October 15, said: “I take responsibility,” and said she had accepted all the recommendations of an independent panel that investigated the incident and that held lower-level officials responsible. Nobody is more committed to getting this right. I am determined to leave the State Department and our country safer, stronger and more secure. People have accused Ambassador Rice and the administration of, you know, misleading Americans. Nothing could be further from the truth. Obama On Benghazi 3 Months Later: "Sloppiness" But "We Have Some Very Good Leads"
When you read the report, and it confirms what we had already seen based on some of our internal reviews, there was just some sloppiness, not intentional, in terms of how we secure embassies in areas where you essentially don’t have governments that have a lot of capacity to protect those embassies. So we’re doing a thorough renew. not only will we implement all the recommendations that were made, but we’ll try to do more than that. You know, with respect to who carried it out, that’s an ongoing investigation. The FBI has sent individuals to Libya repeatedly. We have some very good leads. Fox News White House correspondent Ed Henry told the AP [1. http://politicalwire.com/archives/2012/12/06/correspondent_says_fox_news_overplayed_benghazi.html] that Fox News probably over-covered the fallout from the attacks on the U.S. consulate in Benghazi, Libya. I wouldn’t lie to you. I see that we’re covering Benghazi a lot, and I think that should be something that we’re asking about. We’ve had the proper emphasis. But I would not be so deluded to say that some of our shows, some of our commentators, have covered it more than it needed to be covered. The father of Tyrone Woods says he learned the details of his son’s bravery not from the Obama administration, but in an email from an American whose life was saved by his son. Woods said his son was found slumped over his machine gun, which was caked with blood. He had continued to fire until he had no blood left and was unable to fire anymore. McCAIN: We are significantly troubled by many of the answers that we got and some that we didn’t get, concerning evidence that was overwhelming leading up to the attack on our consulate, [and] the tragic deaths of four brave Americans. The information she gave the American people was incorrect,” when she described the Benghazi attack “as a spontaneous demonstration triggered by a hateful video.” Added McCain: “There was strong evidence at the time that this was not correct. Ayotte said Ambassador Rice was wrong, the CIA was wrong, and the President was wrong. And she added that neither the CIA nor the President have come out to admit they were wrong or set the record the straight. In his first public comments since his incarceration Nakoula told The New York Times that he would go to great lengths to convey what he called “the actual truth” about Muhammad. I thought, before I wrote this script, that I should burn myself in a public square to let the American people and the people of the world know this message that I believe in. As a senior US diplomat, I agreed to a White House request to appear on the Sunday shows to talk about the full range of national security issues of the day, which at that time were primarily and particularly the protests that were enveloping and threatening many diplomatic facilities—American diplomatic facilities—around the world and Iran’s nuclear program. The attack on Benghazi—on our facilities in Benghazi—was obviously a significant piece of this. When discussing the attacks against our facilities in Benghazi, ”’I relied solely and squarely on the information provided to me by the intelligence community.”’ I made clear that the information was preliminary and that our investigations would give us the definitive answers. Everyone, particularly the intelligence community, has worked in good faith to provide the best assessment based on the information available. You know the FBI and the State Department’s Accountability Review Board are conducting investigations as we speak, and they will look into all aspects of this heinous terrorist attack to provide what will become the definitive accounting of what occurred. There was not an intelligence failure. The intelligence community had it right, and they had it right early. What happened was it worked its way up through the system of the so-called talking points, which everyone refers to, and then it went up to what’s called a deputy’s committee…It went to the so-called deputy’s committee, that’s populated by appointees from the administration. That’s where the narrative changed. And so how that thing got back to (Susan) Rice, I think, is probably another question. King: Who changed talking points? Petraeus left Capitol Hill around noon, after testifying in private hearings before the House and Senate intelligence committees. I have no comment about my schedule and I’m not going to comment on how I spend my time to the media. David Petraeus had originally been scheduled to testify before the House and Senate intelligence committees Thursday 15 November. That appearance was scuttled, though, after the director abruptly resigned over an extramarital affair. A source close to Petraeus he has contacted the CIA, as well as committees in both the House and Senate, to offer his testimony as the former CIA director. 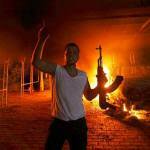 He is expected to speak off-site to the Senate Intelligence Committee on Friday about his Libya report. The House side is still being worked out. Lawmakers have begun to openly question when Petraeus first knew about the investigation that uncovered his affair — and whether it impacted his statements to Congress on Sept. 14 about the Libya terror attack. Petraeus briefed lawmakers that day that the attack was akin to a flash mob, and some top lawmakers noted to Fox News he seemed “wedded” to the administration’s narrative that it was a demonstration spun out of control. The briefing appeared to conflict with one from the FBI and National Counterterrorism Center a day earlier in which officials said the intelligence supported an Al Qaeda or Al Qaeda-affiliated attack. CBS News releases a clip of an interview by Steve Kroft of 60 Minutes on September 12 with President Obama that indicates Obama knew the assault on the U.S. consulate in Benghazi, Libya was a premeditated terror attack. CBS chose not to broadcast the clip for over a month, instead airing a portion of the clip that contained Obama’s attack on Romney that same night. However, the clip and quote were available online. A report on CNN questions the veracity of the email mentioning the Facebook post. Aaron Zelin, a research fellow at the Washington Institute for Near East Policy who tracks dozens of jihadist websites told CNN he was unaware of any such claim having been posted on the official Facebook page or Twitter feed of Ansar al-Sharia in Benghazi. Zelin, says that there is no Facebook update between September 8 and September 12, when a posting late that afternoon first referenced the attack, in which the group denied Ansar al-Sharia’s role in the assault on the consulate, while sympathizing with the attackers. Posting something on Facebook is not in and of itself evidence. I think it just underscores how fluid the reporting was at the time and continued for some time to be. The independent accountability review board is already hard at work looking at everything, not cherry picking one story here or one document there, but looking at everything – which I highly recommend as the appropriate approach for something as complex as an attack like this,” she said. Suspected Ringleader of Attack scoffs at U.S. The New York Times reports that Ansar al-Shariah leader and suspected Benghazi ringleader Ahmed Abu Khattala was seen in a crowded Benghazi luxury hotel sipping mango juice as he claimed that no Libya authorities had questioned him and, by the way, he had no plans to go into hiding. Witnesses, Benghazi residents and Western news reports, including those in The New York Times, have described Mr. Abu Khattala as a leader of Ansar al-Shariah, but he has said he was not part of the group, but close to it. Although Khattala said he was not a member of Al Qaeda, he declared he would be proud to be associated with Al Qaeda’s puritanical zeal for Islamic law. And he said that the United States had its own foreign policy to blame for the terrorist attacks of Sept. 11, 2001. Khattala contended that the attack had grown out of a peaceful protest against the “innocence of Muslims” video. He also said that guards inside the compound — Libyan or American, he was not sure — had shot first at the demonstrators, provoking them. And he asserted, without providing evidence, that the attackers had found weapons, including explosives and guns mounted with silencers, inside the American compound. Although Khattala’s exact role remains unclear, witnesses have said they saw him directing other fighters that night. Libyan officials have singled him out, and officials in Washington say they are examining his role. However, Khattala insisted that he had not been part of the aggression at the American compound. He said he had arrived just as the gunfire was beginning to crackle and had sought to break up a traffic jam around the demonstration. After fleeing for a time, he said, he entered the compound at the end of the battle because he was asked to help try to rescue four Libyan guards working for the Americans who were trapped inside. Although the attackers had set fire to the main building, Khattala said he had not noticed anything burning. OBAMA: The day after the attack…I stood in the Rose Garden and I told the American people and the world that we are going to find out exactly what happened. That this was an act of terror and I also said that we’re going to hunt down those who committed this crime. Commentators attempt to fact check the President’s comments. I take responsibility. I’m in charge of the State Department’s 60,000 people all over the world (at) 275 posts. However, Clinton does not resign, nor does Obama ask her to resign. Republicans keep up their attack. Sen. Lindsey Graham, R-S.C., says presidential aides deliberately covered up the details of the attack so that voters wouldn’t question Obama’s handling of the war on terror. The White House defends Biden’s “we weren’t told” debate statement; Carney says Biden was referring to the White House, the president and himself.